Due to a previous contractual agreement the signature of Jason Heyward does not appear on the team signature bat. In 2016 the Chicago Cubs broke two very long championship droughts. It had been 71 years since the Cubs last won an NL Pennant, and it had been 108 years since the Cubs last won the World Series. This beautiful two bat set commemorates these two long awaited championships. 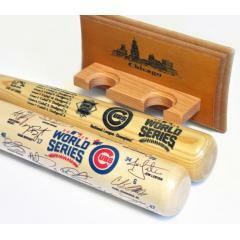 This set includes one (1) World Series Champions Team Signature Bat, one (1) authentic Louisville Slugger NL Pennant bat and one (1) FREE custom Chicago Skyline Two Bat Display Rack - a $59.95 savings. The World Series Signature bat has the World Series champion roster on the barrel with the words "World Series Champions." The Louisville Slugger NL Pennant ash bat has the scores from the NLCS and the words "National League Champions" laser engraved on the barrel. 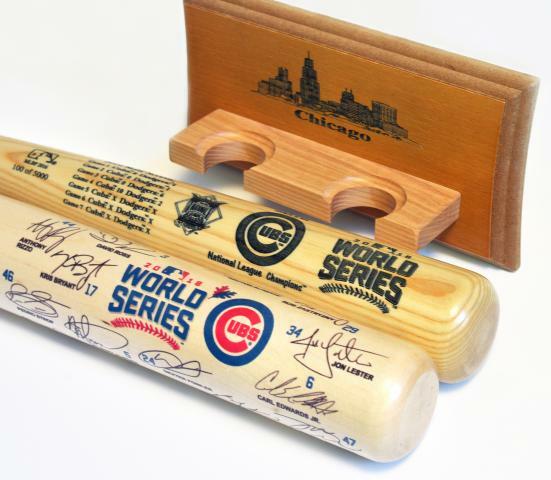 This set is a great addition every Cubs fan's collection of team memorabilia. Order yours today. Due to the limited nature of this offer we must charge your credit card for the full amount immediately upon taking your order. This policy ensures we reserve a set for you. We will confirm your order by email. Bats are not game used. Please allow 2 to 4 weeks for delivery.